Once, an NRI and an American were sitting side by side in the business class of a plane while traveling to India from the USA. The NRI was going on a business trip to India, and the US traveler was going to make his first India tour. The latter was curious about his destination. He was more in the know of ancient India than the 21st century India, and therefore, he was keen to see camels, snake charmers, rural belles carrying earthen pots on their heads, etc. He greeted the NRI with a broad smile and got into a conversation with him. The NRI’s sense of humor made the conversation funny. The US traveler: Hello! Are you from India? The NRI: Yup (taking the magazine down from in front of his face). The US traveler: Were you born on the soil of India? The NRI: On the soil and under the sky of India! The US traveler: (felt amused) Very nice! Is India hot? The NRI: Hmm! It is hot and cool just like American guys and gals. The US traveler: I see! Where are snake charmers found in India? The NRI: Are you on a mission to catch the snake charmers of India? Sorry! Recently, they have been rehabilitated on the moon. The US traveler: On the moon! I will visit Rajasthan first. It is the land of camels. The NRI: You’re absolutely right (with a suppressed lough). Don’t forget to have a camel ride. The US traveler: I will ride on camel all around Rajasthan. The NRI: Animal rights activists in India will award you for the ride. The US traveler: Indians are known for their sweet tooth for desserts. The NRI: We have a sweet tooth for salt too. The US traveler: Which direction is South in India? The NRI: You had better find it on Google map. The US traveler: I will visit Rabindranath Tagore in Bengal. The NRI: He is busy writing. Seek an appointment first. The US traveler: I will, I will. Do you use perfume in India? The NRI: No. Indians are too gentle to seduce ladies. The US traveler: Is Taj Mahal visible at night? The US traveler: Where does Aishwarya Rai live in India? I have seen her on a TV show? The NRI: She lives in the mind of every Indian. The US traveler: Are there dance floors in Indian cities? The NRI: Indians dance on the roof in cities (with a smile). How did you enjoy the fun? 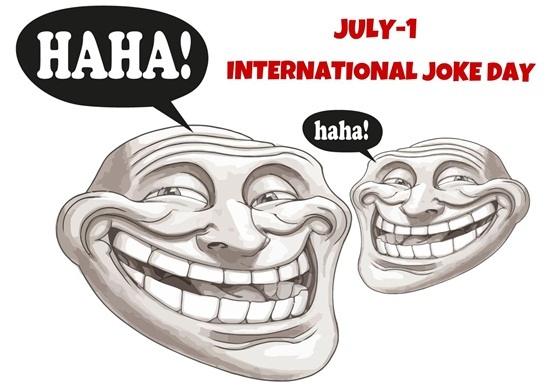 We at Travel Beats, an Indian community portal by Indian Eagle Travel, celebrates International Joke Day with you. Happy Joke Day! Like us on Facebook and Twitter. Indian Eagle books the cheapest flights to India, even for last-minute travel. Hey, it is not a joke!